One of the shows that I had been eagerly awaiting as soon as it was announced is the London return of A Chorus Line which started previews at the London Palladium earlier this month. I admit I have never seen this show on stage before but I do know the movie and the score and think it’s one of those all time classics that every fan of musical theatre should be familiar with. On the day I attended the show there were quite a few understudies on stage. I didn’t mind one bit because I have always appreciated the hard work of understudies. Plus this meant I got to see the wonderful Rebecca Giocopazzi on stage which definitely was a bonus for me. A Chorus Line basically tells the story of several dancers who are trying to get a part in the chorus of a Broadway show. We get an insight into their personal struggles and in the end we realise that these individuals work so hard just to be one of many in a big chorus. We see the chorus members in their glittering costumes – all smiling and looking exactly the same. After we’ve gotten to know them individually they are reduced to one chorus – no one gets to stand out. This show is about hope, second chances and trying to fulfill your dream and the often brutal reality of rejection and failure. In this production John Partridge plays Zach, the director who is looking to hire dancers for the chorus of his latest Broadway show. Personally my main problem with John Partridge is that whenever I see him on stage there’s something cat-like about him, at least that’s what I see. This is definitely due to having seen him as Rum Tum Tugger several times. But that aside I think he does a great job in the show. His Zach is determined without losing his human touch. And John certainly still “has it” when it comes to dancing! Lucy Jane Adcock’s Cassie is fragile and quite simply wonderful. She’s not the strongest singer but her dancing is spot on and she really captures the character vulnerability. Georgie Ashford is a feisty Diana and Leigh Zimmerman is one of those performers that just commands the stage. Her portrayal of Sheila is nothing but perfect and once again she amazes me with her dancing skills. A special mention goes to Adam Salter (Mike) who is a fantastic dancer and to Gary Wood whose portrayal of Paul is close to heartbreaking. Considering the show was still in previews and there were several understudies on stage it was amazing to see how tight this company already was. You would never have guessed Lucy Jane Adcock was playing Cassie for the first time. The whole cast worked so well together – it was a pure joy to watch all those talented people on stage. 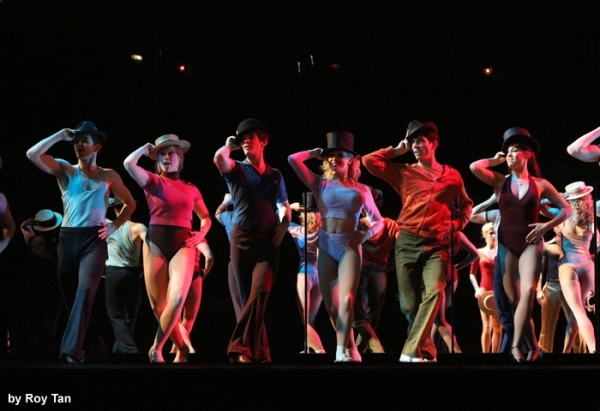 A Chorus Line is back in town and you don’t want to miss this fantastic production. It’s one of those pieces that set the standard for other shows. A Chorus Line doesn’t need fancy sets and hundreds of costumes. This show tells its story through song and dance – and it does so brilliantly. A Chorus Line is on at the London Palladium. For more info and to buy tickets go to http://www.achoruslinelondon.com/.